The new RODE NTG-1 is a lightweight condenser shotgun microphone, specifically designed for professional applications within the film, video, television, voice-over and ENG industries. The NTG-1 provides an electronically balanced output stage and operates on 48 V to the P48 standard. 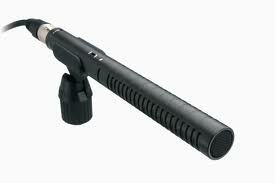 If your camera does not have built-in phantom power see the RODE NTG-2. The NTG-1 offers wide bandwidth and a controlled polar response coupled with low noise SMT electronics. The NTG-1 is extremely lightweight making it ideal for mounting directly to video cameras (with optional accessories) or a Boom pole.